Background: Polygala senega L. is a small perennial herb belonging to the family Polygalaceae. The roots are used as stimulant and expectorant in bronchitis. In Homoeopathy, it is used for hypopyon, paresis of oculomotor nerve, catarrh of pharynx, sore throat, catarrh of bladder, influenza, asthma, whooping cough, soreness in chest, pleurisy, pneumonia, hydrothorax, pleuropneumonia, pneumonia, hydrothorax and ascites. Objective: The objective of the present study deals with morpho-anatomical, powder and physicochemical characteristics of the root of P. senega for developing standards for authentication of drug. Materials and Methods: The current study includes morpho-anatomical, powder and physicochemical studies of the root of P. senega. Physicochemical studies comprise extractive values, ash values, chemical tests, weight/millilitre, total solids, alcohol content and loss on drying. Results: The root are yellowish brown to light brown and has as its unique mark a projecting line on its down side. 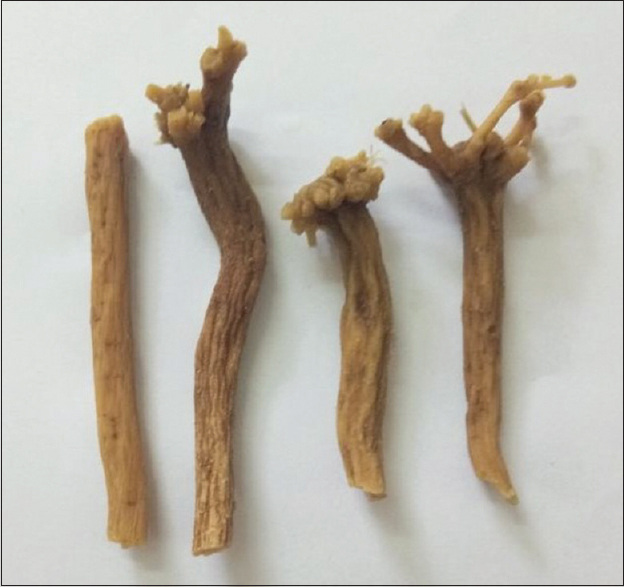 The distinguishing microscopic characteristics of the root included the presence of multilayered phellem, abundant phelloderm interrupted by tracheary elements, acicular crystals, abnormal development of phloem and V-shaped medullary rays. Physicochemical studies of the raw drug and mother tincture are standardised and depicted. Conclusion: The pharmacognostic and physicochemical data depicted in this study may serve as pharmacopoeial standards for identification and authentication of the homoeopathic drug P. senega. Background: Extreme generation of free radicals leads to oxidative stress which has been apprehensive in several disease processes such as diabetic complications and vascular and neurodegenerative diseases. 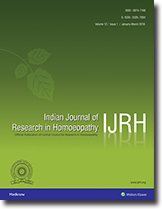 Objective: The present study was designed to evaluate the potential of homoeopathic preparations of Cephalandra indica L. against oxidative stress. Materials and Methods: Potencies of Cephalandra indica (mother tincture, 6C and 30C) were procured from Dr. Willmar Schwabe India Pvt. Ltd. The antioxidant activity of Cephalandra indica was evaluated by employing various in vitro antioxidant methods. Results: The total phenol content was found to be 1905, 849 and 495 mg/g gallic acid equivalents in mother tincture, 6C and 30C of Cephalandra indica and total antioxidant capacity was found to be 2710, 759 and 510 μM/g ascorbic acid equivalents, respectively. Mother tincture, 6C and 30C of Cephalandra indica was found to have strong reducing power, 2,2-diphenyl-1-picrylhydrazyl radical, hydrogen peroxide, nitric oxide and superoxide radical scavenging activity. Percentage inhibition of AGEs formation by mother tincture, 6C and 30C of Cephalandra indica (10–50 μl) was found to be 30.34%–91.77%, 29.98%–65.71% and 33.05%–57.75%, respectively. Mother tincture, 6C and 30C of Cephalandra indica showed inhibitory effect against sorbitol accumulation with IC50value of 26.12 μl, 203.10 μl and 897.3 μl, respectively, whereas, in aldose reductase inhibition assay, the IC50value was 32.54 μl, 175.02 μl and 834.34 μl, respectively. Conclusion: The results revealed that homoeopathic preparations of Cephalandra indica exhibit protective effect against oxidative stress. Aim: To assess the prevalence and prognostic factor of Aranea diadema in a population responding well to Aranea diadema. Material and Methods: It was an open label, multicentric observational study wherein patients having minimum two known symptoms matching with the pathogenesis of Aranea diadema were prescribed the remedy in 6C, 30C, 200C, and 1M potencies. The collected data were presented in terms of descriptive statistics. Results: A total of 6806 cases were enrolled. Out of which a total of 172 cases were analysed, and demographic analysis shows male/female: 109/63; mean age 28.3 years. There were “clinical successes” in 115 cases (67.0%) and no response in 57 (33.1%) cases. The number of symptoms found prevalent in responders included proving (n = 13) and literature (n = 8). Symptoms coming from provings guide homoeopathic practitioners in prescribing their medicines, but should also be confirmed in patients responding well to these medicines. Significantly higher prevalence was observed among responders in respect of six tentatively confirmed symptoms (prevalence): Forgetfulness (0.11), white coated tongue (0.21), epistaxis (0.10), thirstlessness (0.13), seminal emissions (0. 23), and fever (0.12). 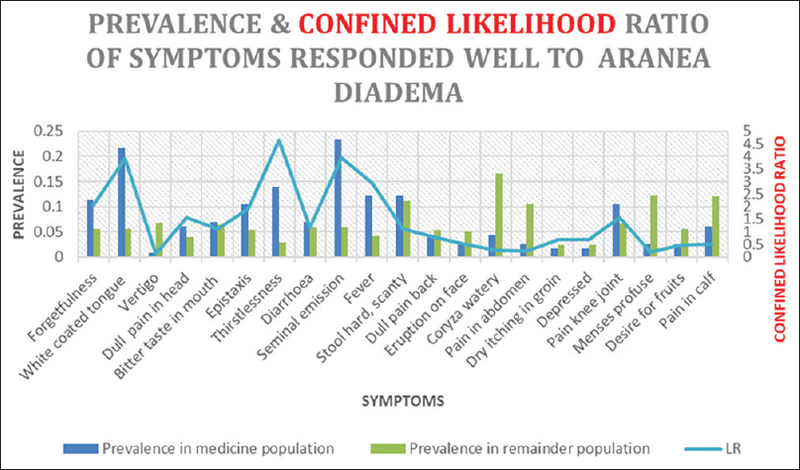 Conclusion: This study was conducted to assess the prevalence of symptoms in a population responding well to Aranea diadema and to compare this with the prevalence of these symptoms in other populations. If a symptom has a higher prevalence in a population responding well to Aranea it indicates the increase of likelihood of a curative action of Aranea when that symptom is present. Our “test”is not meant to diagnose an illness but to increase the accuracy of prescribing Aranea diadema. Background: The purpose of this study was to compare the efficacy of ibuprofen and Belladonna in the control of orthodontic pain and to ascertain the pain relief by Belladonna in comparison with ibuprofen during orthodontic separation. Materials and Methods: Patients, between 20 and 35 years of age, 51 females and 21 males, were included in this study. 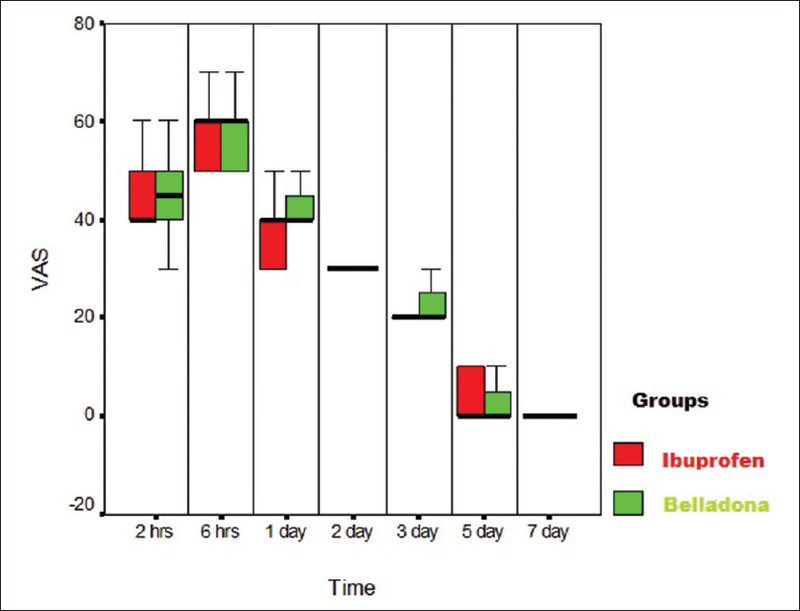 Patients were randomly divided into two groups; one group was assigned to ibuprofen 400 mg and second group was allocated to Belladonna 6C group. Patients were given two doses of medication of their respective groups, 1 h before placement of elastomeric separators (Ormco Separators, Ormco Corporation, CA, USA) which was administered in the department and one dose 6 h after the placement. Pain scores recorded on visual analogue scale (VAS). VAS was a 10 cm scale with millimetre calibration to record their pain at the following intervals, 2 h after placement, 6 h after placement, bedtime, day 1 morning, day 2 morning, day 3 morning and day 5 morning. Results: Post hoc comparisons indicated that there was no difference between the two groups at 2 h (P = 0.77), 6 h (0.073), 1 day (P = 0.120), 2 days (P = 0.283), 3 days (P = 0.363), 5 days (P = 0.622) and 7 days. Conclusion: Ibuprofen and Belladonna 6C are effective and provide adequate analgesia with no statistically significant difference. Lack of adverse effects with Belladonna 6C makes it an effective and viable alternative. Background and Objectives: This study was conducted with the primary objective of evaluating efficacy of Homoeopathy in establishing the menstrual regularity with improvement in either ultrasonological findings or hirsutism/acne. The quality of life was also assessed using polycystic ovary syndrome questionnaire (PCOSQ). Materials and Methods: A single-blind, randomised, placebo-controlled pilot study was conducted from February 2014 to May 2015 at two research centres. 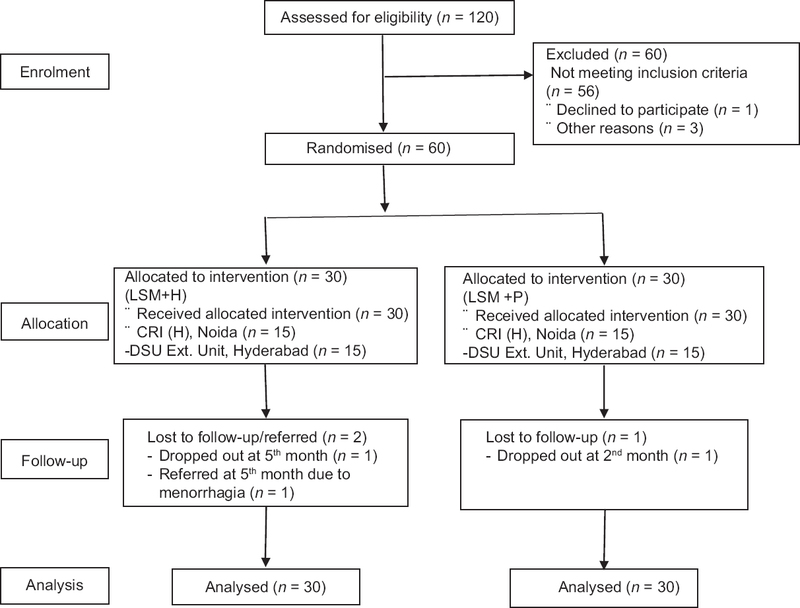 The cases fulfilling the eligibility criteria were enrolled (n = 60) and randomised to either the homoeopathic intervention (HI) (n = 30) or identical placebo (P) (n = 30) with uniform lifestyle modification (LSM) for 6 months. Results: The menstrual regularity with improvement in other signs/symptoms was observed in 60% of the cases (n = 18) in HI + LSM group and none (n = 0) in control group (P = 0.001). Statistically significant difference (P = 0.016) was observed in reduction of intermenstrual duration (from 76.1 ± 37.7 to 46.6 ± 38.7 days) in HI + LSM in comparison to placebo + LSM group (from 93.0 ± 65.2 to 93.9 ± 96.2 days). In PCOSQ, also, significant improvement was observed in HI group in domains of weight, fertility, emotions and menstrual problems (P < 0.05) with no difference in body hair (P = 0.708). 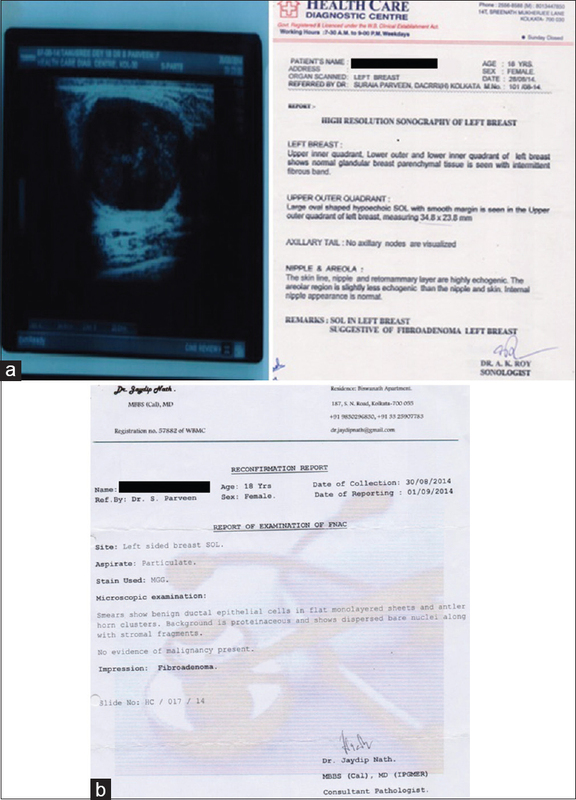 No change was observed in respect of improvement in the ultrasound findings. Pulsatilla was the most frequently indicated medicine (n = 12, 40%). Conclusion: HI along with LSM has shown promising outcome; further comparative study with standard conventional treatment on adequate sample size is desirable. Fibroadenoma is the commonest benign breast tumor in adolescent and young women. Conservative management with regular observation is the rule for newly diagnosed patients. For progressive growth in young patients or failure of regression in patients above 35 years surgical intervention is contemplated. But there may be recurrence after surgery and patients are often apprehensive of surgery. Here, a 18-year-old girl presented with a palpable, non-tender, movable lump in the left breast at upper outer quadrant progressively increasing in size over last 2 years and was advised for surgery. Sonomammography and FNAC confirmed it as simple fibroadenoma (3.48 × 2.38 centimeter). She was successfully treated by individualized homoeopathic treatment with single medicine Pulsatilla nigricans over 15 months. Serial Sonomammography reports revealed progressive regression of Fibroadenoma to non palpable state. Possible causal attribution of changes was explicitly depicted by Naranjo Criteria. It shows positive role of Homoeopathic treatment in regression of fibroadenoma in a young woman.